A very murky start to the rides this year, leading to the surreal experience of riding up Carn Brea with the monument completely hidden in the mist. 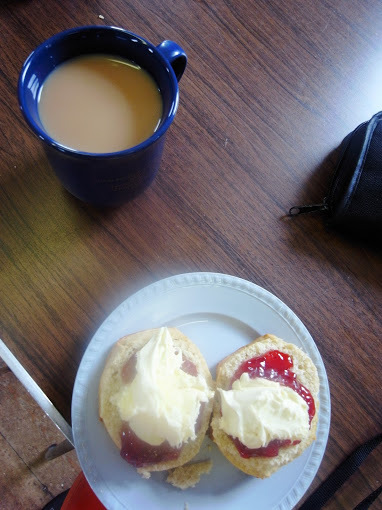 The weather improved dramatically around the mid-point return to Carharrack for pasties, ending with sunshine and a delightful cream tea. Chris Rayne has photos of the events here. An unexpectedly large number of last minute arrivals left some would-be off-roaders disappointed this year – a reminder to enter ahead or at least warn the organiser if large parties are intending to enter “on the line”. Order your choice of pasty and either rice pudding or scone with cream and jam with your entry. “bramble rash” but this was all taken in good spirit by the time they tucked into their jam and scones at the finish. what a great event! I will definitely be there again next year! Thanks”. 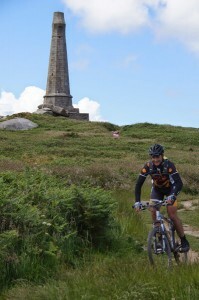 Thanks to the riders who participated and raised a modest sum for Cornwall Hospice Care. If you have any objection to any photograph in which you appear and would like it removed, please contact Chris Rayne (email <sunshine_chris>, a hotmail address) clearly identifying the photograph(s) and it will be deleted. Finishers lists are available from the links below.